After the heat of summer comes typhoon season to clear the air in Japan and then the temperature falls as winter draws in. Early November is still comfortable in Tokyo and walking outside in a shirt is possible, but not for long. Soon it will be freezing, the snows already falling in the north of the country. But with winter also comes onsen season. 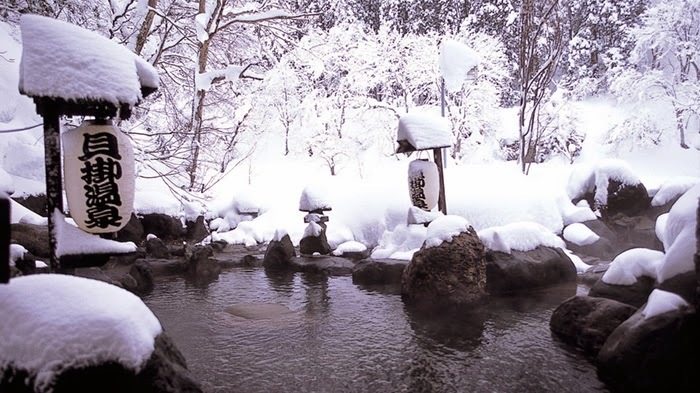 An onsen is a natural hot springs, often in the mountains, designed for a relaxing evening, soaking in the reputedly therapeutic waters. Resort towns have grown up around the springs and people will travel for a weekend away for nothing else than to eat, drink and have a bath. In summer the temperatures are too warm and the springs are often empty but as the weather cools they become part of a national pastime. These days they are mostly separated but family pools are still popular allowing everyone to enjoy their time together. But the best are the outdoor baths, the rotenburo, especially in the snow. Sitting neck deep in how water with snowflakes coming down, towel neatly folded on your head, what could be better than that.